BILLINGS, Mont. – With the sixth pick in the championship round during the PBR (Professional Bull Riders) Unleash The Beast Billings Invitational, presented by Cooper Tires, Cody Teel (Kountze, Texas) selected After Midnight, a bull that had only been ridden one other time in its career. The move proved successful as the Texas cowboy earned his second victory of the season. Teel was 3-for-4 in the three-day event, bucking off his first-round bull before earning qualified rides on Testimony (EJ Cattle Co./Paradigm Bull Co.) in Round 2 for 83.75 points, Timber Jam (Vold Rodeo) in Round 3 for 85.75 points and then the Wallgren & Hale Bull Co./Barnes Rodeo bovine in the final round of the event. Teel rode After Midnight for 86.75 points to earn the victory in the championship round. Teel earned 605 points towards the world standings, allowing him to jump from No. 9 to No. 6. He also took home a paycheck of $42,350. With the win, Teel also earned an invite to the Komatsu Equipment Days of '47 Cowboy Games and Rodeo presented by Zions Bank in Salt Lake City on July 19-24. 2016 PBR World Champion Cooper Davis (Jasper, Texas) finished in second place, earning 362.5 world points. Davis was 3-for-3 going into the championship round and was looking to win his first event of the 2019 season. After riding War Cry (Wentz Bucking Bulls/New West Rodeo) in Round 3 for 81 points, Davis boldly selected SweetPro’s Bruiser (D&H Cattle Co./Buck Cattle Co.) for his last bull of the night. The three-time World Champion Bull had other plans, dispatching Davis in 4.01 seconds to remain unridden on the weekend. The big, brown bovine athlete was the YETI “Built for the Wild” Bull of the Event after bucking off Silvano Alves (Pilar do Sul, Brazil) in 6.14 seconds in Round 1 and then dispatching Davis in the final out of the event for equal 45.50 points. Joao Ricardo Vieira (Itatinga, Brazil) finished in third place. He covered his first three bulls before hitting the dirt early in the championship round. Vieira started his weekend off with 87 points aboard Homegrown (Eno Bucking Bulls), then earned 82 points on Cow-ah-bunga (Corey & Lange Pro Rodeo/Flying Diamond Rodeo) in Round 2. On Championship Sunday he covered Leona’s Pet (Dakota Rodeo-Chad Berger/Clay Struve/Ken Barnhard) for 82.25 points in Round 3 but Rewind (Corey & Lange Pro Rodeo/Flying Diamond Rodeo) got the better of the 34-year old Brazilian in the final round of the event. Vieira earned 225 points towards the world standings along with $9,650. With his best finish in 2019, Derek Kolbaba (Walla Walla, Washington) earned fourth-place, picking up 205 world points. With those important world points, Kolbaba vaulted from No. 27 to No. 15 in the world. Kolbaba started his weekend off with a no-score on Colt .45 (Wild Hogs/Lou Streeter) but rebounded with 86.25 points on Billy Hill (Corey & Lange Pro Rodeo/Flying Diamond Rodeo) in Round 2 and then 88.5 points on Black Rose (Broken Arrow Bucking Bulls) in Round 3. Despite the confidence the 22-year old showed by selecting Smooth Wreck (Dakota Rodeo/Chad Berger/Clay Struve/Diamond Willow) in the championship round, he still hit the ground in 5.79 seconds. Last year’s winner in Billings, Claudio Montanha Jr. (Pacaembu, Brazil) was unable to secure a second victory in “Big Sky Country” but still earned a fifth-place finish. Montanha picked up 160 world points along with $8,625. He made the whistle aboard Rising Sun (Dakota Rodeo/Chad Berger/Clay Struve/Heald Pro Bulls) in Round 1 for 87.25 points but couldn’t hold on aboard Yee Haw (Corey & Lange Pro Rodeo/Flying Diamond Rodeo) in Round 2. Montanha covered Red Beard (Mossyrock Cattle Company) in Round 3 for 87.25 points but was unable to get past Soup In A Group (Dakota Rodeo/Chad Berger/Clay Struve/Wilks Ranch) in the championship round. Replays from Round 3 and the Championship Round from Billings will be available starting at 8 a.m. ET on Monday, April 15 on Ridepass.com or via the RidePass mobile app. After a week off for Easter, the Top 35 bull riders in the world will head to Columbus, Ohio, for the Wrangler Long Live Cowboys Classic presented by Cooper Tires, at the Schottenstein Center on the campus of Ohio State University on April 27-28. In other PBR action this weekend, Daylon Swearingen (Piffard, New York) captured the first PBR Pendleton Whisky Velocity Tour event win of his career, victorious at the Wichita Classic in Wichita, Kansas. The 19-year-old’s win was highlighted by the high-marked ride of his career, winning Round 1 courtesy of an 89-point ride on Test Me (GT Bucking Bulls/Cody Garrett). 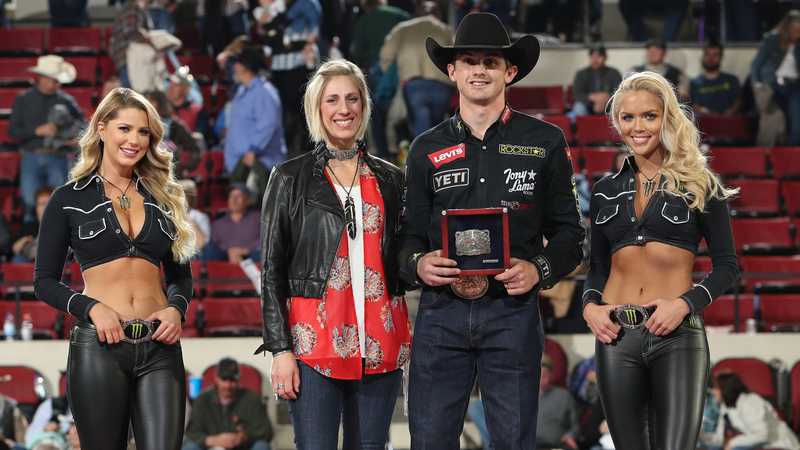 For his efforts, Swearingen netted $10,850 along with 220 world points. Gaining significant ground in the world standings, the New Yorker rose from No. 65 to No. 35. Courtesy of the win, Swearingen also earned an invite to compete on the elite PBR Unleash The Beast in Cheyenne, Wyoming, at the third Major event of the season, Last Cowboy Standing, on July 22-23 at Frontier Park. 1. Daylon Swearingen, 89-0-89.00-220 Points. 2. Paulo Ferreira Lima, 87.5-0-87.50-115 Points.